This pair will be my next earring purchase! 2009 is all about using up what I currently have and not ordering new bath and body items unless I really need them. I did place 2 orders this month: a mini Cleanse Your Soul order for 2 perfumes for $18 which included shipping (I had a coupon code from the CGL blog) and a small Cocoa Pink order of shampoo and conditioner (all on clearance; shampoo was $3). C & G readers know that I do like to treat myself once in awhile. 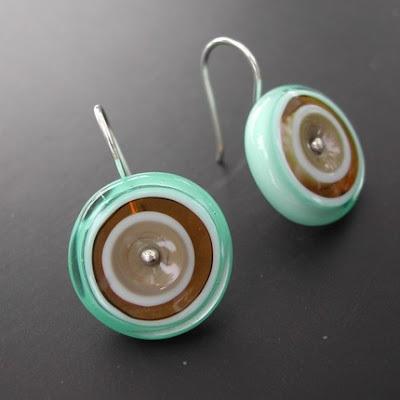 I bought some lovely earrings yesterday from Kristin Perkins Glass Jewelry on Etsy. 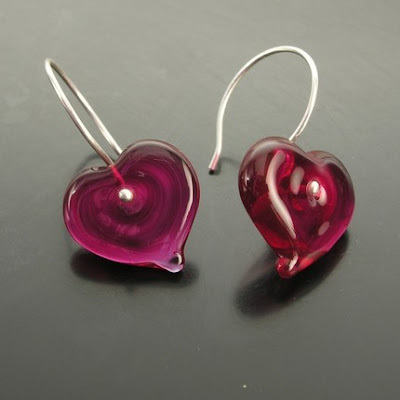 They are little fuchsia hearts and I cannot wait to get them in the mail! I will wear these often to add a punch of color when I'm wearing black or charcoal. They're lovely--and will be pretty on Valentine's Day. I already am scoping out a pair from Kristin's shop to buy as my little treat next month. They're chocolate brown and aqua and will be perfect for spring! I wear earrings daily and these will serve me well for years to come!